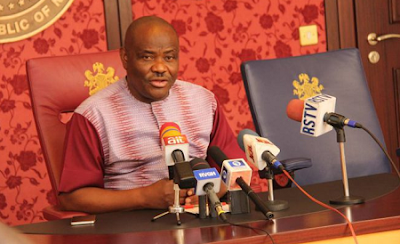 The Rivers State Governor, Nyesom Wike, on Sunday gave an indication that the 2019 election in Rivers State could be as violent as previous elections. Mr. Wike, of the Peoples Democratic Party, PDP, has been having a running battle in the state with his predecessor and current transportation minister, Rotimi Amaechi, who is of Nigeria’s ruling All Progressives Congress, APC. Mr. Wike’s statements were contained in a statement by his spokesperson, Simon Nwakaudu, who said the governor spoke at a thanksgiving service. The governor also spoke about a recent ruling by the Court of Appeal that annulled the election of a PDP senator and replaced him with that of the APC. “2019, they will not succeed. As far as we are concerned, we have no senator in Rivers East. The man going there has no capacity to represent us,” he said. Read Mr. Nwakaudu’s full statement below. Rivers State Governor, Nyesom Wike, has decried the destruction of key national institutions by the poor governance model of the APC Federal Government. In his remarks, George Sekibo reiterated his declaration that he received unflinching support from Governor Wike and Ikwerre people all through his political struggle. Delivering his sermon, Richard Okpara urged judicial officers to use their constitutional powers for the good of the country. He also called on the Federal Government to learn to accommodate all political interests, saying that the political space should not be overheated.